Organically grown tomatoes, pesticidefree lettuce, and meat from healthy animals - more and more Austrians seem to have a growing appetite for organic food. Austrian consumers not only buy organic food because they feel that it is better for their health, but they also appreciate its rich taste, as well as the environmental benefits of organic agriculture. 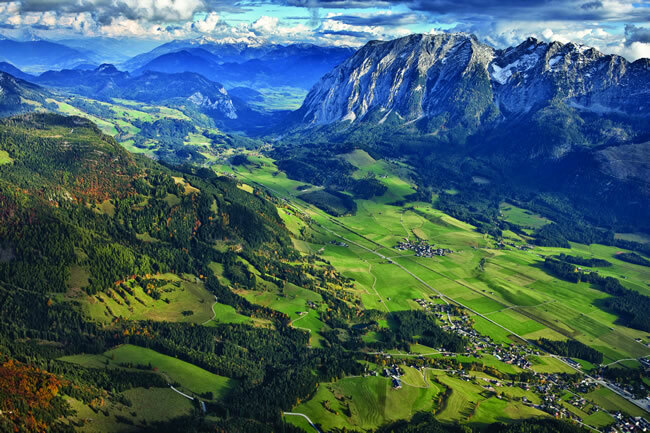 Austria has a long tradition of organic food, and the Alpine Republic today is known as Europe’s “organic farming country number one.” In 1927, the first organic farm was established in the lush, green hills of the state of Carinthia. Austria also played a pioneering role in implementing the first official guidelines for organic farming in 1983. It was not until the early nineties, however, that organic agriculture received a major boost when the number of organic farms increased more than eightfold. A further step along the organic path was taken by the food retailer REWE International AG, when the corporation’s supermarket chains Billa, Merkur, Penny, and Adeg, as well as its drugstore Bipa, began selling organic food in their stores. With its own brand called Ja! Natürlich, the corporation wanted to establish organic products in conventional supermarkets and it was not long before these efforts met with success. Soon, other grocery stores followed the organic movement: Natur pur is the organic brand of the business group Spar and even the discount stores jumped on the organic bandwagon with brands like Zurück zum Ursprung, and Natur Aktiv owned by Hofer, or BioBio belonging to Zielpunkt. The discounter Lidl attracts health conscious customers with organic produce labeled Biotrend. With such an abundance of organic products on hand, one may wonder what the word “organic” actually means. If a product carries the organic logos and labels of the Republic of Austria or the European Union, both the farmers and the processing sector have to meet certain legal requirements. After all, no less than 95% of the product’s ingredients must come from organic agriculture. Thus, the farm is the place where the organic cycle begins, and in order to remain true to the green concept, organic farmers have relied on a variety of recognized agricultural practices for decades: it is, for example, common knowledge that organically grown food is free from exposure to synthetic chemicals, such as herbicides or pesticides. However, this is only one of the many principles applied in organic agriculture. Farmers also preserve the fertility and biological activity of the soil by rotating crops and making use of compost or livestock manure rather than synthetic fertilizer. Furthermore, they keep animals according to the needs of their species, allowing them free access to pasture through free-range systems and providing them with organically grown feed. The use of antibiotics, hormones and other growth promoters is strictly prohibited. Like farmers, the processing sector must also follow strict guidelines, which ensure that the goods are produced almost exclusively from ingredients of organic agricultural origin. While it is legitimate that up to 5% of the goods’ components, such as cocoa butter or pepper, may not be products of organic farming, ingredients like artificial flavorings or color additives are strictly forbidden. The same applies to genetic engineering. In Austria, organic farmers are not even allowed to provide their livestock with feed based on genetically modified organisms. If all these requirements are observed, one can use aus biologischer Landwirtschaft (from organic farming) on the packaging of the product for sale at an Austrian supermarket. Since farms and processors are inspected at least once a year by independent control agencies, a code number has to be printed on the packaging as well. In addition, one may also find the label BIO or the AMA Organic Seal, indicating that all raw materials of the product were grown organically. Since July 2010, the mandatory placement of the EU organic logo makes it easier for consumers to identify organic food and drinks from other EU countries. Once the product is labeled, consumers are able to recognize organic goods at first glance, and Austrians are buying more and more organic products. Around 6.5% of all goods purchased in retail stores are organic and the percentage continues to increase. Especially when it comes to eggs, milk products, bananas, potatoes or tomatoes, Austrians tend to choose the organic option over the conventional. Asked why they are choosing the green alternative, 33% of those surveyed said they believed that organically grown food provided more health benefits. Eleven percent claimed that it tasted better and another nine percent buy organic produce due to the fact that largescale conventional farming causes greater environmental concern. Who are those who actually follow the green path? Studies have shown that the higher the level of education, the more likely people are to purchase organically raised food. Accounting for about 40% of sales of organic products, this group makes a significant contribution to the success of the organic market in public. Austrian families tend to attach great importance to eating “organic,” while single households generally show less interest in joining the organic movement.